This medication is used to treat a certain mental/mood disorder (pseudobulbar affect). This disorder may occur due to various conditions that affect the brain (such as stroke, amyotrophic lateral sclerosis-ALS, multiple sclerosis). This medication may help decrease sudden outbursts of uncontrollable/inappropriate laughing and/or crying. This medication is a combination of 2 ingredients: dextromethorphan and quinidine. Dextromethorphan works in the brain, though it is not known exactly how it helps treat pseudobulbar affect. Quinidine is added to this medication to increase the effect of dextromethorphan. Take this medication by mouth with or without food with a full glass of water (8 ounces/240 milliliters) as directed by your doctor, usually one capsule every 12 hours. Do not lie down for 10 minutes after taking this medication. To reduce your risk of side effects, your doctor may direct you to start this medication at a low dose (usually one capsule daily for 7 days) and gradually increase your dose. Follow your doctor's instructions carefully. Avoid eating grapefruit or drinking grapefruit juice while being treated with this medication unless your doctor instructs you otherwise. Grapefruit juice can change the amount of certain medications in your bloodstream. Consult your doctor or pharmacist for more details. What conditions does Nuedexta treat? Diarrhea, dizziness, cough, vomiting, weakness, or swelling in the hands/ankles/feet may occur. Infrequently, slight drowsiness may also occur. If any of these effects persist or worsen, tell your doctor or pharmacist promptly. Tell your doctor right away if any of these serious side effects occur: easy bruising/bleeding, dark urine, muscle spasms, signs of infection (such as fever, persistent sore throat), stomach/abdominal pain, yellowing eyes/skin, lupus-like symptoms (joint/muscle pain, chest pain). Get medical help right away if any of these serious side effects occur: fainting, fast/irregular heartbeat, severe dizziness. This medication may increase serotonin and rarely cause a very serious condition called serotonin syndrome/toxicity. The risk increases if you are also taking other drugs that increase serotonin, so tell your doctor or pharmacist of all the drugs you take (see Drug Interactions section). Get medical help right away if you develop some of the following symptoms: fast heartbeat, hallucinations, loss of coordination, severe nausea/vomiting/diarrhea, twitching muscles, unexplained fever, unusual agitation/restlessness. List Nuedexta side effects by likelihood and severity. Before taking this medication, tell your doctor or pharmacist if you are allergic to dextromethorphan, quinidine, quinine, or mefloquine; or if you have any other allergies. This product may contain inactive ingredients, which can cause allergic reactions or other problems. Talk to your pharmacist for more details. Before using this medication, tell your doctor or pharmacist your medical history, especially of: blood/bone marrow disorder (such as low platelets/white blood cells/red blood cells), a certain enzyme deficiency (G6PD deficiency), kidney disease, liver disease, lupus-like syndrome, myasthenia gravis. Quinidine may cause a condition that affects the heart rhythm (QT prolongation). QT prolongation can rarely cause serious (rarely fatal) fast/irregular heartbeat and other symptoms (such as severe dizziness, fainting) that need medical attention right away. The risk of QT prolongation may be increased if you have certain medical conditions or are taking other drugs that may cause QT prolongation. Before using quinidine, tell your doctor or pharmacist of all the drugs you take and if you have any of the following conditions: certain heart problems (heart failure, slow heartbeat, QT prolongation in the EKG), family history of certain heart problems (QT prolongation in the EKG, sudden cardiac death). Low levels of potassium or magnesium in the blood may also increase your risk of QT prolongation. This risk may increase if you use certain drugs (such as diuretics/"water pills") or if you have conditions such as severe sweating, diarrhea, or vomiting. Talk to your doctor about using quinidine safely. What should I know regarding pregnancy, nursing and administering Nuedexta to children or the elderly? Some products that may interact with this drug include: fingolimod, propafenone. This medication can slow down the removal of other medications from your body, which may affect how they work. Examples of affected drugs include aliskiren, codeine, digoxin, mefloquine, tricyclic antidepressants (such as desipramine, imipramine), among others. Other medications can affect the removal of quinidine from your body, which may affect how quinidine works. Examples include cobicistat, mifepristone, certain azole antifungals (including fluconazole, itraconazole, ketoconazole, posaconazole, voriconazole), certain protease inhibitors (such as nelfinavir, ritonavir, tipranavir), among others. Many drugs besides quinidine may affect the heart rhythm (QT prolongation), including artemether/lumefantrine, ranolazine, toremifene, antiarrhythmic drugs (such as amiodarone, disopyramide, dofetilide, dronedarone, ibutilide, sotalol), antipsychotics (such as pimozide, thioridazine, ziprasidone), certain quinolone antibiotics (grepafloxacin, sparfloxacin), among others. Quinidine is very similar to quinine. Do not use medications containing quinine while using quinidine. Does Nuedexta interact with other medications? Should I avoid certain foods while taking Nuedexta? If someone has overdosed and has serious symptoms such as passing out or trouble breathing, call 911. Otherwise, call a poison control center right away. US residents can call their local poison control center at 1-800-222-1222. Canada residents can call a provincial poison control center. Symptoms of overdose may include: severe dizziness, fainting, fast/irregular heartbeat. Keep all regular medical and psychiatric appointments. Laboratory and/or medical tests (such as complete blood count, liver function) may be performed periodically to monitor your progress or check for side effects. Consult your doctor for more details. 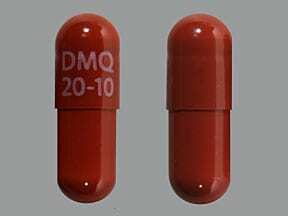 This medicine is a brick red, oblong, capsule imprinted with "DMQ 20-10". Are you considering switching to Nuedexta? How long have you been taking Nuedexta?